165 years ago the California Gold Rush brought the 49ers to the Golden State and they have been coming ever since! Only in the last 75 years, the unending stream of them are from around the globe and they bring the gold with them. As we will hear from Ken Fischang next Wednesday, our guests and visitors are the economic driver that contributed $209 million into Sonoma County’s economy last year. So what’s the big deal? Clear blue skies, a great climate, great wine & food, the spectacular scenery, beautiful people…Luther Burbank was right. Why do we need a convention and visitor’s bureau? You will get some reason why next Wednesday at the Rotary meeting. The Flamingo’s Grand Ballroom was overflowing this week with Rotarians, special guests, three program presenters, and Past President (1967-68) Chuck Bartley, who has been a dedicated Rotarian since 1956. 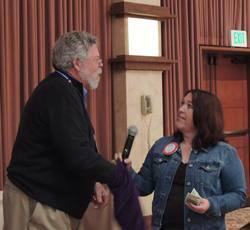 Do the math…that’s 57 years, more than half the life of the Rotary Club of Santa Rosa! Past President (2004-05) Yale Abrams was at the podium, filling in for lame duck president William Rousseau, who has only 14 meetings to go. Counting his Debunking! A third, much younger Past President, Joel DeSilva, led the group in a rousing Pledge to the Flag. Many folks assume the first day of spring in the Northern Hemisphere is March 21st as that’s the day on which it has fallen in the recent past. But this year is an exception, for in 2013 the first day of spring arrived on March 20. Interestingly, spring is currently being reduced by approximately one minute per year, and winter by one half minute per year. Summer gains that minute lost from spring and autumn gains the half-minute lost from winter. Paul Hamilton informed us that this week our Rotary Club had no visiting Rotarians. Yale Abrams introduced his spouse, Terry Abrams, and Craig Meltzner welcomed his guests—District 5130’s outbound Exchange Student, Leah Steiger, who will be spending next year visiting the Scandinavian country of Finland, and Cindy & Iris Avenell, the current host family for this year’s Exchange Student from Taiwan, Sophia Lai. Diane Moresi welcomed Marina Harrison and Deborah Gray introduced her guest, Ray Giampaoli, announcing that he has submitted his application for our Rotary Club. 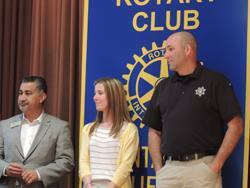 And Past President Marnie Goldschlag welcomed today’s program presenters, Santa Rosa City Councilman Ernesto Olivares, Police Sergeant Eric Goldschlag, and Serena Lienau from the Mayor’s Gang Prevention Task Force. Gesine Franchetti was stunned speechless when Yale announced that she had been chosen as February’s Rotarian of the Month. All she could manage was, “I have nothing to say!”, especially after our past president said that, since she was a chef and the owner of two restaurants, Gesine would not be getting the usual gift certificate to dine out, but would receive instead a year’s supply of Rolaids! Seriously, Gesine, congratulations and thank you for all you do behind the scenes for Rotary. Bill Rousseau recalled that Carmen was honored last year as Rotarian of the Year and was selected “Young Rotarian of the Year” by Rotary District 5130, which includes more than 50 Rotary Clubs in the five counties along California’s north coast to the Oregon border. A licensed attorney & partner with the law firm of DeMeo, DeMeo and West, Carmen, husband Brian, and their two children live in western Sonoma County. New Rotarian and Red Badger Manuela Gonzalez conducted the raffle like a pro, announcing that today’s jackpot stood at $588, and called on visiting law enforcement officer Eric Goldschlag, who drew Blaine Goodwin’s not-so-lucky ticket. Blaine quietly accepted his $10 consolation prize and returned to his seat…leaving the Joker Jackpot to continue to grow for next Wednesday’s big drawing. Because Past President Yale announced that he would not have time to name names for member recognitions, we were all surprised when he began harassing another past president to uncover something finable. Ray Dorfman was so outraged by the injustice that Mr. Abrams quickly moved on to the always- guilty Paul Hamilton. Paul admitted that it was his fault that St. Mary’s defeated Middle Tennessee that he donated $50 to his grandson’s Paul Harris Fellowship. Creed Wood was next on Yale’s list and proudly admitted that he indeed had been seen at the Giants’ spring training camp and contributed $50 to the club and $50 to son Christopher’s Paul Harris. 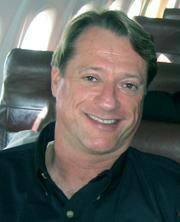 Eager for more Rotary recognition, Mark Burchill could not restrain himself and bragged about his upcoming 26 March birthday celebration on the beach at Santa Cruz…$25 pre-paid in advance to the club! French Group Study Exchange Team: In the absence of President William, Jim Johnson reminded us of our obligation to help local Rotary Clubs provide housing, vocational opportunities, and cultural exposures to the GSE Team who will be our guests from Thursday, May 23 until they leave for the District Conference on Friday morning, May 31st. Wednesday night every Rotarian received an email packet of contact information and volunteer forms containing the team member’s names and vocations. President Bill encourages us to read the details and volunteer to help Rotary host our visitors that week. For more information and to volunteer, please contact coordinator Sandie Krutz from Windsor. Her email address is sckrutz@aol.com. 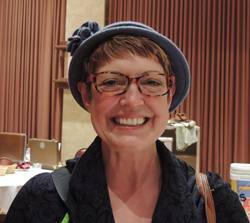 Sandie’s cell phone number is 650-339-0953 and her home telephone number is 707-837-5210. Craig Meltzner reminded us of the great importance that Rotary International places on Rotary’s extensive Exchange Student efforts to connect with young adults around the globe and emphasized incoming and outgoing Exchange Students as today’s guest speaker Wan Ling Lai, from a small village in southern Taiwan. Sophia Lai attends Montgomery High School to develop her English skills and learn as much as possible about Santa Rosa and immerse herself in American culture, living in the homes of her Sonoma County hosts. Craig believes strongly in the opportunity to share traditions and customs and concluded asking that each of us please consider being a host family. 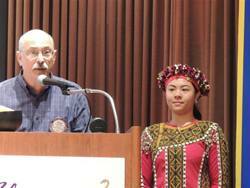 Wearing a traditional aboriginal dress covered with glass beads for which her country of Taiwan is famous, Sophia fulfilled one of her requirements as an exchange student—to give a 15 minute speech in English describing her life and experiences growing up in in Ping Tung, a small village on the southern tip of the island nation of Taiwan, more than 200 miles south of the capital of Taipei in the very north of her country. She showed us photographs of the home where she lives with her mother and five siblings—a three-story building covered with white tiles, complete with a second floor balcony and a terraced entry way. She described her community as “agricultural & industrial” and gave us a few samples of local food, describing two favorites—a “Stinky Tofu” and “Tapioca Milk Tea”. The photos looked much better than they sounded! Sophia’s public school is several miles from her home, in the hills near a large mountain. From her comments it seemed that most students travel some distance to attend. Her favorite pastimes are singing and sports; and she loves badminton! Wan Lin Lai was her birth name but she chose Sophia as her American name, at least for her senior year at Montgomery High School. As one of 35 exchange students from Taiwan, she said she came to the United States to learn English and as much as possible about life in the United States…to absorb American and California lifestyles and traditions. She spent a few minutes sharing with us her language and other familiar memories of her life and family customs: “Ken ding” is the name of the sandy beach nearby where her friends and family enjoy Taiwan’s hot summers. She told us that the island of Taipei covers only 3,600 square miles, with a population of 23 million people. This week’s program was put together by Past President Marnie Goldschlag with assistance of seasoned Police Sergeant Eric Goldschlag, and Serena Lienau from the Mayor’s Task Force. Ernesto Olivares—retired police officer with 30 years’ service, former director of the Task Force, member of the City Council, and most recently the Mayor of Santa Rosa—completed the panel of experts. Olivares immediately turned the calendar back ten years to what looked like a well-intentioned Cinco de Mayo celebration in Roseland’s huge, abandoned shopping center crowded with hundreds of restive Hispanic youth and crowds of visitors from outside the community. It was a warm evening and as the music blared, the loudspeakers kicked in, and a gang riot broke out in the streets, four people were shot, 2 were stabbed according to Sergeant Goldschlag, and the night quickly moved out of control. Everyone realized that gang violence was not just a big city problem anymore. The second video several years after was a stark contrast. After many public meetings, entire communities were engaged, with local schools involved along with churches, neighborhoods, gang mediation and intervention services. In 2004 concerned taxpayers passed Measure O, with tax money matched from other sources, and the work continues. Gang violence still exist, but it is under cover and less noticeable. Police statistics illustrate thousands of officer calls and emergencies. Criminal citations, crowded courts and jails are quite evident, but gang crimes are down, street violence exits, but more from reckless driving & inattention, alcohol and drugs. Gang crimes are down with more undercover. Questions were asked and discussed with feedback in both directions and well worth the efforts. Thanks to the panel and to Rotary’s participation.